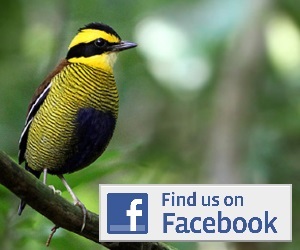 Sulawesi has the highest percentage of endemic birds of any island in the world. The birding in many places is also easy, and almost all the endemic species can be seen at a small number of sites in the centre and north. For those looking for more adventure (and more birds!) the islands off the north of Sulawesi (Sangihe, Talaud, Siau) are also packed with goodies, as are the islands to the east (Banggai, Peleng). If thats not enough to tempt you, it also has great beaches and world class diving. Tangkoko Easy access and a great introduction to Sulawesi's birds. Dumoga-Bone (Bogani) A massive national park which has only partially been explored. Known sites include Tambun for Maleo and some nice lowland birding. Lore Lindu Huge national park in central Sulawesi and the best site for easily accessed montane endemics. 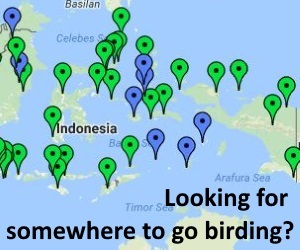 Sangihe, Taluad, Siau The string of islands off north Sulawesi including Sangihe, Siau and Talaud are not so easy to get to, but loads of great endemics await those who try it. Around Makassar An endemic white-eye and some good migrant shorebirds can be found by those with a few hours to kill between flights. Gunung Ambang Montane birding in north Sulawesi. Not as many species as Lore Lindu, but a few things are easier to see here. Gunung Mahawu Just outside Manado and a great spot for Scaly Kingfisher. Banggai A nice selection of Sula endemics after a short boat ride from Luwuk, including the newly rediscovered Banggai Crow.